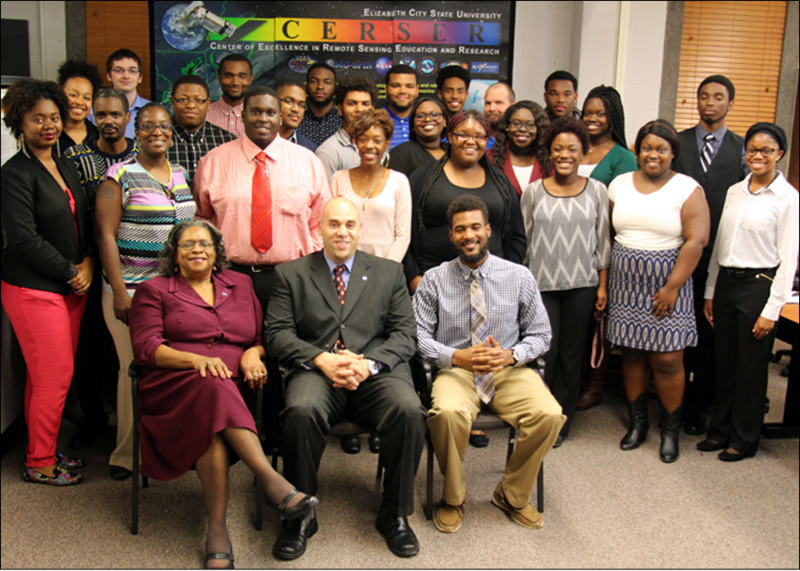 The Distinguished Lecture guest speaker, Dr. Gamaliel “Dan” Cherry, presented opportunities for internships, scholarships, and fellowships within NASA. Dr. Cherry currently serves as the NASA Educator Professional Development Line of Business Deputy. He received his doctorate degree in Instructional Design and Technology from Old Dominion University and has worked with NASA for ten years in the areas of Education and Human Resources. Dr. Cherry emphasized that students should fill in their profiles at NASA’s One Stop Shopping Initiative Recruiting NASA Interns, Fellows, Scholars (OSSI NIFS) in order to be a part of the pool of potential applicants (https://intern.nasa.gov/ossi/web/public/main/). OSSI is a NASA-wide system for the recruitment, application, selection and career development of undergraduate and graduate students primarily in science, technology, engineering and mathematics disciplines. Elizabeth City State University does not endorse, sponsor or provide material located on this site.